These monthly guides will help you plan for your trip to Canada or decide which month is the best time for you to travel. Find out average temperatures, weather conditions, what to pack, and what to expect in the way of major events and holidays across the country. Most everywhere in Canada is cold in January. The BC lower mainland, including Victoria and Vancouver, however, have markedly milder winters. Despite the weather, people get out to celebrate Canada's best winter festivals. February is the coldest month in most places across Canada, but this fact is compensated by plenty of winter festivals to keep people busy. Some provinces celebrate a public holiday in February called Family Day. Lots of travel bargains are available, however prices go up a bit during the university winter break, which occurs at the end of the month. The snow of winter continues to melt away and travel season is still low. Many visitors continue to come to Canada for spring skiing or to visit sugar shacks for maple syrup tasting - mostly in the eastern provinces, especially Ontario and Quebec. One week in March, which varies by province, will see increased travel due to school break. Cities across Canada will also don green and stage St Patrick's Day parades. The first full month of spring offers warmer temperatures and travel bargains before the high summer season begins. Ski season is still going full tilt - more so in the higher mountains out west - and spring bulbs are blooming in most Canadian provinces - most notably during the Ottawa Tulip Festival. 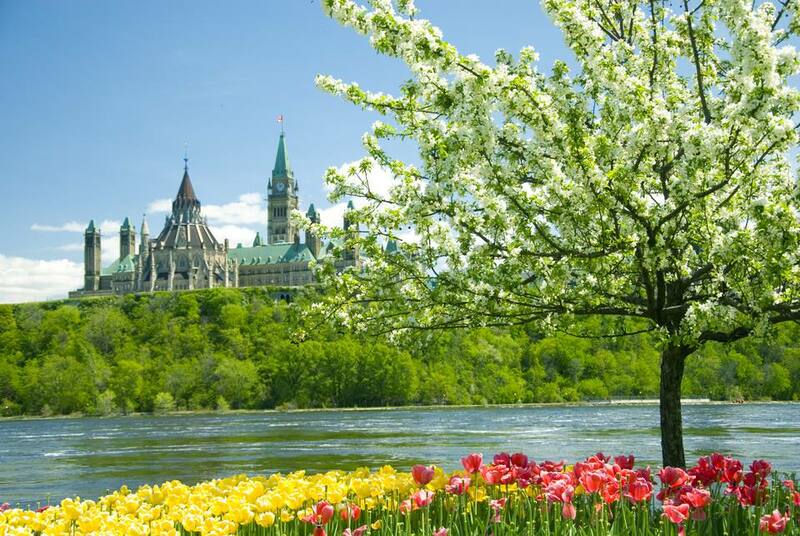 Springtime in Canada offers warmer temperatures and travel bargains before the high summer season begins. You may still encounter snow in the Rockies, but tulips and daffodils are blooming in most Canadian provinces. Temperatures are warm but the humidity in the eastern provinces is not yet at its peak, making weather conditions quite comfortable. Some of the bigger Canadian events and festivals take place in June, but most are scheduled for July and August. Prepare yourself for blackflies, which can make a camping or cottage vacation miserable; these critters are abundant in early summer in eastern Canada. The weather is either hot and humid in the eastern provinces or warm and comfortable out west. Either way, July offers some fantastic travel opportunities across Canada, but flight and hotel prices reflect the popularity of the season. With cooling temperatures and the start of stunning fall foliage in Canada in the eastern provinces, September is a popular time to travel in Canada. The Labour Day weekend, a holiday that Canada shares with the US, bids farewell to summer and ushers in September and is one of the most popular weekends to travel. Temperatures continue to dip, but the fall foliage in Canada reaches its peak at the beginning of October. Thanksgiving in Canada is the second Monday of October and is a popular long weekend for travel but not nearly to the extent that is in the U.S. Weather conditions are starting to get winter-like, but still pleasant enough to enjoy the outdoors. Lots of travel bargains are available and stores are busy promoting for the Christmas season. Ski season begins toward the end of the month at Canada's most popular ski resorts. Santa Claus Parades start to be staged, with the Toronto Santa Parade being one of the biggest parades in the world. The weather gets colder and visitors may have to prepare themselves for snow storms and winter conditions in December. Travel season picks up as people get into ​the holiday spirit and book time away. Many places close down for the evening of December 24th and December 25th. Boxing Day in Canada on December 26th is the biggest shopping day of the year. The week between Christmas and New Year's is a particularly big travel week, with families heading south to warmer climates or visiting family and friends within Canada.